Earlier this week I covered Paper Monsters: Recut, which sported a unique paper and cardboard world. Now, I turn my attention to a game with a paper and ink world. How crafty of me! Anyhow, here's my review of Ballpoint Universe: Infinite, available on the Wii U eShop. Most likely if you were in school and if you had a boring lecture you were "supposed" to be taking notes on, you might have been mindlessly doodling away. Apparently the folks behind Ballpoint Universe: Infinite had a similar kind of grade school experience, taking the scribblings and doodles that could have been drawn in a sixth grader's Trapper Keeper and turned them into a game world with landscapes, characters, enemies-- everything you imagine. Ballpoint Universe: Infinite is a game of two parts. The first occurs as you venture around the various scenery and landscapes of the game world in a 2D side-scrolling fashion. Along the way are various friendly doodles who will task your character with missions, all shoot-em-up based, the second part of Ballpoint Universe. More on that in a bit. Right away, the visuals do nothing but impress. 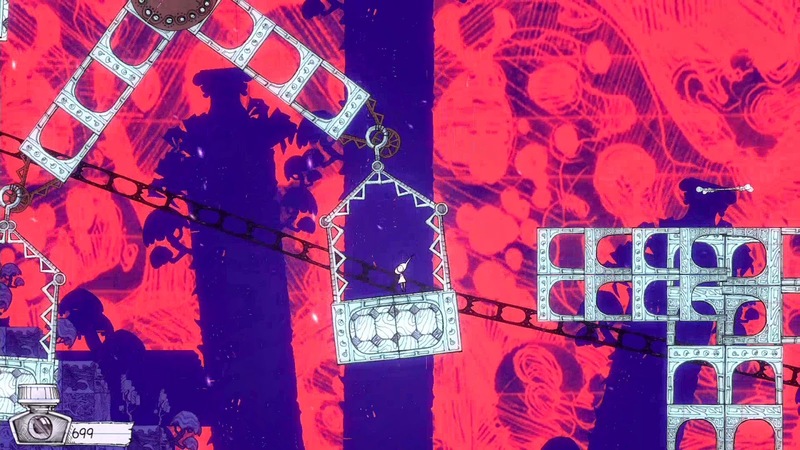 The trip through the world is absolutely gorgeous, full of intricate details, ornate designs, and fantastical areas. Traveling is rather cool in the way that your character can change layers (e.g.. moving from a background plane into one in the foreground). It's just a shame that what could have been a surefire truly enjoyable part of the game is compromised by poor platforming controls. Excuse me while I marvel at this art style. Slippery is the word I would use. Loose is another. Add these together and it's not so bad when all you must do is run along the hillsides and change between layers. 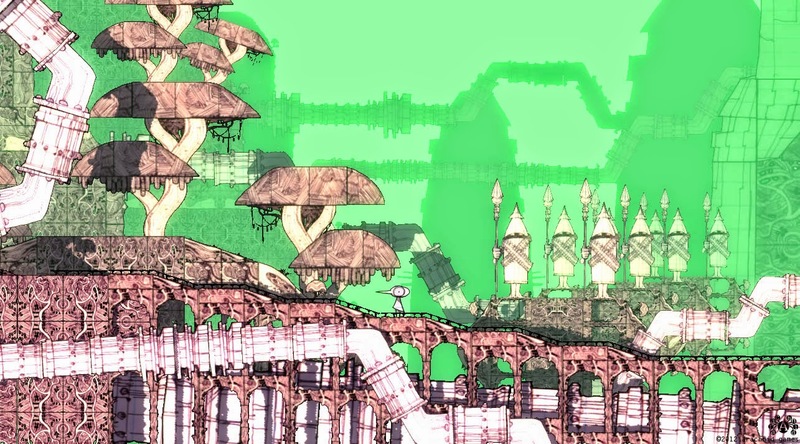 However, that's not all you have to do in Ballpoint Universe: Infinite's overworld. 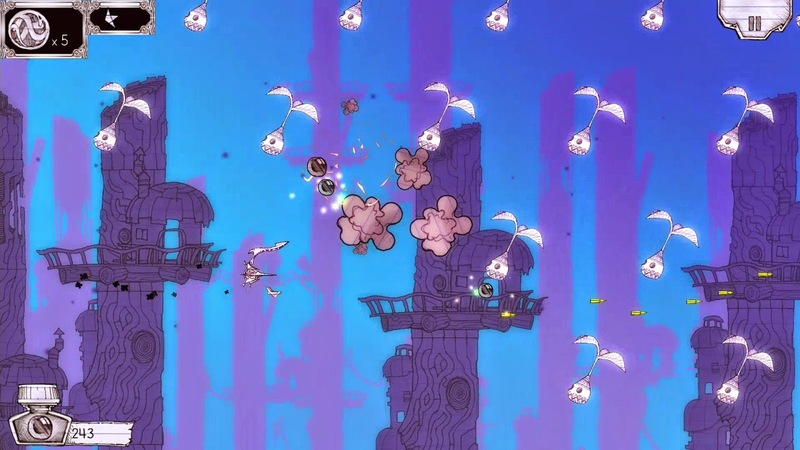 No, despite not having a tight and responsive platforming experience, the developers still desired to throw in platforming challenges in the game. Any such section featuring either small or moving platforms was a genuine black mark on my fun. Now, the penalty for falling into an abyss is simply being placed at the last save point you passed. Not so bad, but it's without a doubt frustrating and bewildering why this was seen as okay by the development team. Precision platforming + slippery controls = GAH! Back to the other portion of Ballpoint Universe: Infinite, the shoot-em-up levels, this game has those in spades with the aim of not only reaching the end of the stage, but also losing a few lives as possible. Each side-scrolling shooter stage has three medals it awards players based off on how many lives they have accumulated at the end. If you survive with all five lives to your name, then you receive all three prizes, the gold, the silver, and the bronze. The actual shoot-em-up gameplay in Infinite is enjoyable enough, having ships and enemies of all shapes, sizes, and varieties wanting nothing more than to see you eliminated and turned into a crumbled up piece of paper in a waste can. Your ship can be customized by spending ink collected in space battles and won as rewards. Your spaceship has four segments to it, an upper arm, a lower arm, a special ability, and a body for defensive capabilities. There's a wide range of weapons and parts to purchase, so if you're in a completionist mood, then you'll definitely have fun grinding ink for parts to collect the entire arsenal. Unfortunately, I found that despite starting out with a machine gun, it felt more like a peashooter blasting against a steel safe than something formidable against foes. In fact, most of the starting, affordable weapons were pretty poor in power compared to my starting melee weapon. Yes, you read that right, a melee weapon in a shoot-em-up. For what would take ten seconds to shoot down a regular enemy, I could just fly near the enemy ship and slash it with my melee weapon, destroying it in an instant (though, melee weapons activate automatically without a player's input). It's not until you earn enough ink to purchase more intimidating firepower that you can play Ballpoint Universe: Infinite's shooter levels like a traditional game in the genre. At the same time, there's really no reason to. I was able to get through the game with a leveled up machine gun and melee weapon, the latter doing the most work. All that was needed to purchase was a body that had enough HP to weather the storm of oncoming attacks to make attaining gold medals a piece of cake. My main takeaway with Ballpoint Universe: Infinite's shoot-em-up sections is that since guns were so obviously weak in comparison to melee attacks, I just resorted to using swords, spears, and blades for dealing with enemies of all shapes and sizes. I'm guessing this is not what the developers wanted, but unfortunately, that's what they got. The enemy design is really something special. 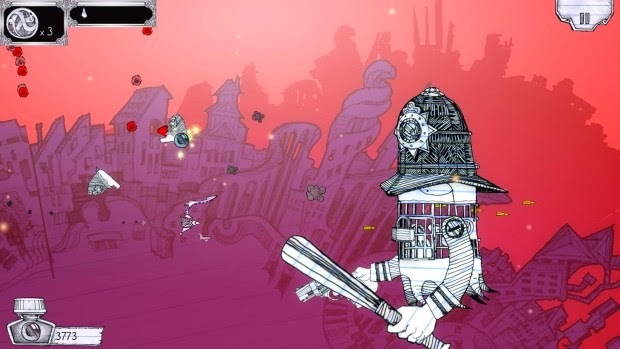 Ballpoint Universe: Infinite can be completed in a few short hours, but there is some replay value to be had. The all-new Infinite level takes you on a journey through wave after wave of enemies in what is essentially an endurance stage. It's engaging to see how far you can get as you blast those Logician paper monsters to shreds. In addition to that, there's also getting golds on every shoot-em-up level, acquiring every Golden Sketch, and other odds and ends. Of course, some of these hidden goodies are tucked away in some precarious locations, which again, those platforming physics and controls won't help in getting easily. For the things Ballpoint Universe: Infinite does right, it does them really well. For what the game fails to do, it fails them pretty hard. From the frustrating platforming to the most likely unintended, strong focus on melee combat in a shoot-em-up, Ballpoint Universe: Infinite has its fair share of problems. However, if you can look past them (and perhaps onto the immaculate art style and design), you'll get a quirky game that is quite unlike anything else out there.